Then ... Larsen has been assigned to tail suspect Camerero, beginning at a small gym alongside the bay. ... here's a view of the gym in a recent photo looking back from that jetty. Then ... next up, an energetic game of handball. ... and Now, the court, in the same building, continues to keep club members on their toes. Then ... Camerero moves on to a hairdressers with a window view that identifies this location... that's Fredericksen's venerable Cow Hollow hardware store across the street. ... and Now, the same view from inside the store that currently occupies this site. To the left it has since been expanded into the store next door. The store is currently the Simply Chic boutique at 3038 Fillmore (map) but back then it was a men's hairstylist called Forum II. 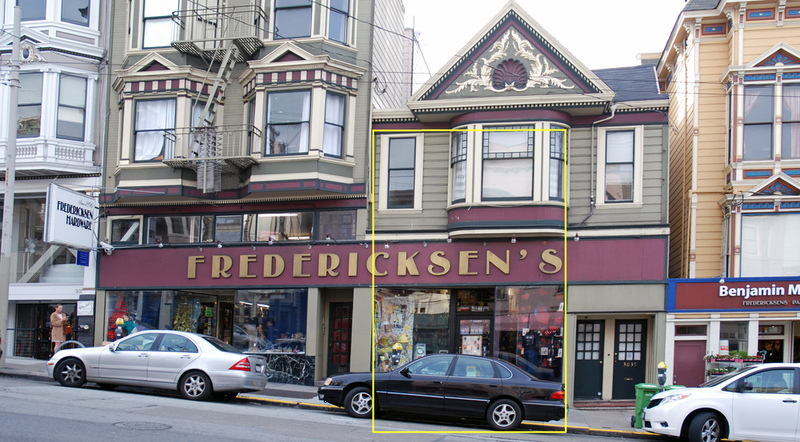 Fredericksen's has been serving the Cow Hollow neighborhood at 3029 Fillmore since 1896. In this recent photo the part of the store visible through the hair stylists' window in the Then image above is outlined in yellow. Then ... The surveillance continues in a parking garage as the suspect walks to his car. ... and Now, this was filmed on level A of the underground garage of One Embarcadero Center in the Financial District. ... and Now, instead, it's the Clay Street exit of the Golden Gateway Garage across the street from One Embarcadero Center (map), viewed from a pedestrian bridge spanning the road. Then ... Jake follows him to a narrow street and watches him pull up outside a club where an awning marks a discreet entrance. ... and Now, this is Ritch Street, an alley in the SoMa South Beach neighborhood close to AT&T Park, home of the San Francisco Giants (map). Then ... As Camerero enters the club the awning displays the address - 330 Ritch Street. This was the Ritch Street Health Club, one of the many bath houses that catered in the pre-Aids era to the gay men's community before they were all shut down by the City in the interest of public health. ... and Now, that same doorway has since been re-addressed as 360 Ritch Street. Comparing the Then and Now images you can see the identical outline of the bricked-in former windows next to the doorway. Today retail and commercial businesses occupy the building including the Little Skillet whose Southern Comfort food serves an eager lunch crowd daily from the shuttered window on the left. Here's a vintage poster advertising the club that left no room for the imagination as to the activities inside. Then ... Inside the club entrance a stairway draped with a colorful tapestry leads up to their "exciting psychedelic 3rd floor". ... and Now, a storage closet has been built under the stairway at left and plain white walls make for a more appropriate approach to the offices above. Then ... Another day but still tailing. Larsen tries his best to look inconspicuous when Camerero walks right by him after exiting the narrow alley flanked by the pair of concrete bollards. Note the vertical sign - 'Poster Alley'. ... and Now, this is Union Street in Cow Hollow - Larsen was sitting at the steps of 1960 Union Street (map) in the center of the seven-block stretch that back then was a much-touted tourist shopping favorite. Poster Alley ran alongside the Artisans poster and framing store at 1964 Union, there since the early 1950s. Customers could view posters and prints hanging in the alley and buy them in the store. Artisans is still in business but recently moved to the Sunset district. In a sign of transition the photo below taken in January 2016 pictures the empty store up for lease. The bollards are still there on either side of the garage door that now blocks access to the old Poster Alley.